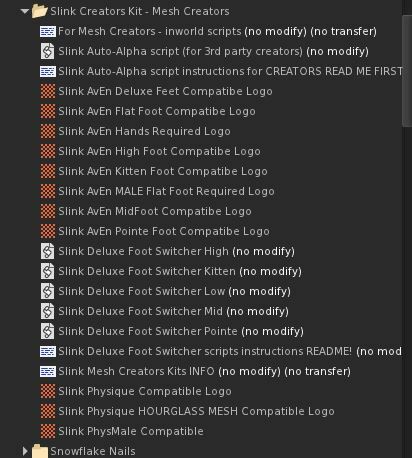 The in-world parts contain the Slink logos and the scripts to control the alpha layers and shoe height. The idea is to set the alpha layers and heights your creations need so that the end user does not have to. They are simple to use and setting up the alpha layers is just a matter of using the Slink HUD’s to set them as needed then adding the scripts and wearing the items. The scripts are a recent addition. So, I haven’t seen any products using them nor have I gotten there yet. I’m too busy buying shoes to make any… But, I think it a great idea. I believe it has the possibility to greatly simplify changing outfits. The second step is to have Blender and AvaStar installed and working. You will need a working AvaStar 1.7.4 and the latest 2RC5. Yes, both of them at the same time, if you have more than one rig to update. You need a Blender install you can use with Avastar 1.7.4 and one with 2RC5, if you want to quickly change between the two or even run them both at the same time. I use the Blender Archive Install process so that I can EASILY have multiple copies of Blender installed. This process uses the Blender zip file and installs into any folder you chose. See my article Blender 2.57b Released for more information on the install. I used Blender 2.77 and 2.78a. When the version number changes, Blender creates a separate set of files; user settings and default startup file. So, I can EASILY have different user settings and add-ons in Blender. I install AvaStar 1.7.4 in Blender 2.77 and 2RC5 in Blender 2.78a. Third: Unpack and open the Physique/Hourglass file emailed to you. 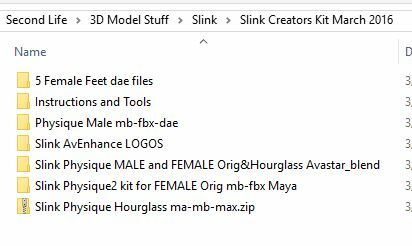 Look through the resulting files to find the folder: Slink Physique MALE and FEMALE Orig & Hourglass Avastar blend. In it is the file: Slink Physique FEMALE Creators Kit March 2016 Original and Hourglass CLEAN.blend. Open the file with Blender and AvaStar 1.7.4. Be sure to uncheck Load UI at the bottom of the tool shelf. The file’s idea of the UI (user interface) is from an older version of Blender. You will want the newer interface. When you open the file, you will get a notice that the skeleton/armature needs to be updated. Click OK and AvaStar will update the rig. Go into Pose Mode and make sure things are working after the update. Move a leg or arm. If they are, save the file with a name that means something to you. Close Blender and Open Blender-AvaStar 2RC5 and use it to open the file you just saved. Fourth: You will see another notice that you need to update the rig. Click OK. This time AvaStar does not automatically update the rig. This is a good thing. Those making elephants and other odd creatures need time to change some update parameters before allowing AvaStar to update the rig. Over in the AvaStar Settings click the Pose & Animation preset. You should see the green Animation Handles. (See image) Check that the model does move, move a leg or arm, something. This tells us that rig and mesh are correctly linked. Leave things as they are after your test, just make sure the move or rotation command is complete and closed. I Control-Z to return to the base pose position. Now, in the AvaStar panel. Open the Tools sub-panel. You will see a button labeled: Update Rig. Select either BASIC or EXTENDED to get the armature you need. For Slink, BASIC is all that is needed. This selection is important and the reason AvaStar does not automatically update the rig. There are other options to select, like: Attach Sliders. I leave them at the default settings. Seems to work OK. Most of those settings are to help those working with exotic non-human skeletons. Click the Update Rig button to update the rig. Fifth: Check that it worked. Move a leg or arm. You can also check the Sliders. Open the AvaStar panel then the Appearance sub-panel or tab, whichever you call it. Adjust the Body Fat. The mesh body should change size. If not, there is a problem. All I can say is it is this set of steps that I found works and tried a lot of different processes over the last 2 days. If all works, save this file as a master, a file from which you can start new projects. Sixth: At this point you may realize the Hourglass body is displaying. To change to the Physique body, change to Object Mode and right-click the body mesh. Look in the Outliner panel/window, expand the Avatar section. The Hourglass entry will be highlighted. Just below it is the Physique Original body. Change the visibility to make Hourglass hidden and reveal Physique or vice-versa by clicking the ‘eye’ icons. That is about it for this task/problem. From this point on, the Slink and Machinimatrix tutorials provide information on transferring weights and basic weight painting. They are up-to-date enough as these processes haven’t changed much. See: YouTube: Siddean Munro and Gaia Clary or on Vimeo see: AvaStar. On Machinimatrix see: Avastar 2.0-beta23 information, which is very much like RC 5 version, currently the latest version. Also, they have v2.0 docs here. The last link is too an article all budding mesh designers should read. This entry was posted in Animation, Blender, Clothes Skins Etc, Second Life and tagged Avastar, Slink. Bookmark the permalink. Nal, It’s been awhile since I’ve done any work with any of these bodies, but I do know that it is probably not best to promote the 2.0.23 version of Avastar, as it has many bugs. It would seriously confuse and frustrate many people. RC5 is out now, so it is probably best to use, and promote that version.